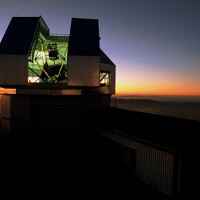 On a rugged Arizona mountaintop, astronomers will soon switch on a new, state-of-the-art instrument to hunt for planets circling distant stars: the Extreme Precision Doppler Spectrometer (EPDS). Pennsylvania State University, led by Principal Investigator Dr.SuvrathMahadevan. Earlier this year, NASA issued an open invitation for researchers to submit proposals to build a cutting-edgeEPDS instrument, with the goal of installing it on the existing 3.5-meter WIYN telescope atKitt Peak in Arizona by the fall of 2018. Six teams submitted proposals in response to NASA’s invitation and, of those, two have been selected for further study. Those two teams will advance their concepts to preliminary designs, and deliver study reports to NASA in January. NASA will select one of the teams based on the results of those studies.The new instrument will employ a standard method to capture evidence of exoplanets: detecting subtle Doppler shifts in starlight. As planets orbit, they tug their host stars this way and that, alternately squeezing and stretching the waves of starlight that reach our telescopes. When operational in October 2018, the new spectrometer will have the precision to measure a star’s line-of-sight velocity (its “wobble”) to better than 0.5 meters per second (1 mile per hour). For context, the average human walking speed is about 3 miles per hour. Such extreme precision is needed to measure the mass of an Earth-sized planet orbiting a sun-like star. The size of the star’s wobble reveals the mass of the orbiting planet, whether a massive gas giant like Jupiter or a small, rocky world like Earth. Combined with data from NASA space telescopes such as Kepler (operating since 2009) and TESS (to be launched in 2017), the new EPDS instrument will confirm planetary candidates discovered by those missions and improve our understanding of their properties.